Wowie, all of a sudden It. Is. September. I hope everyone had a lovely summer! Around this time of the year I always have a little moment where I reflect on the summer and tend to feel just a tiny tinge of sadness that I will have to tuck away my sandals soon for yet another fall-slash-winter. BUT any warm weather remorse doesn’t last long because you guys, FALL IS THE BEST. Well, mostly fall baking and scarves are the best. Summer pies are awesome and all, but I totally get it, no one wants to spend time around a hot oven during the summer months (and one could make the argument that the streets of New York are pretty much like a hot oven anyways) since they should be spent at the beach, or camping under the stars or laying on a patch of grass with a popsicle – all of which I was lucky to have taken advantage of this summer. But without a doubt whenever the weather starts to change ever oh so slightly – as it is starting to do here in Brooklyn – I have an internal honing device and without trying I find myself with a wooden spoon in my kitchen with my mixing bowls practically yelling about how much they’ve missed me. I may have hugged my muffin tin yesterday. In my defense, me and the muffin tin, we go way back and it’s been a minute since we’ve had a hang. So I made these bars and I got mah groove back. They are the perfect way to ease yourself back from a short baking hiatus. They are not at all fussy and use only pantry ingredients which is perfect if due to summer travel your kitchen has not been kept fully stocked OR if you use vegan chocolate then they are a perfect vegan dessert. A win-win either way and the melted chocolate dip and sprinkles make them look super fancy. These bars also travel well and they would be the perfect thing to bring to that last al fresco picnic! Preheat the oven to 350 and line an 8×8 pan with foil or parchment. Set aside. 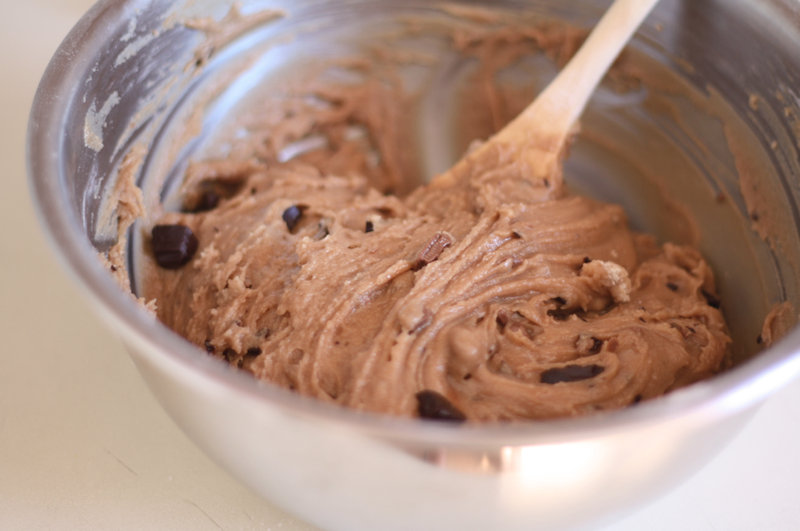 In a small bowl, whisk together flour, baking powder, salt and milk and dark chocolate chunks. 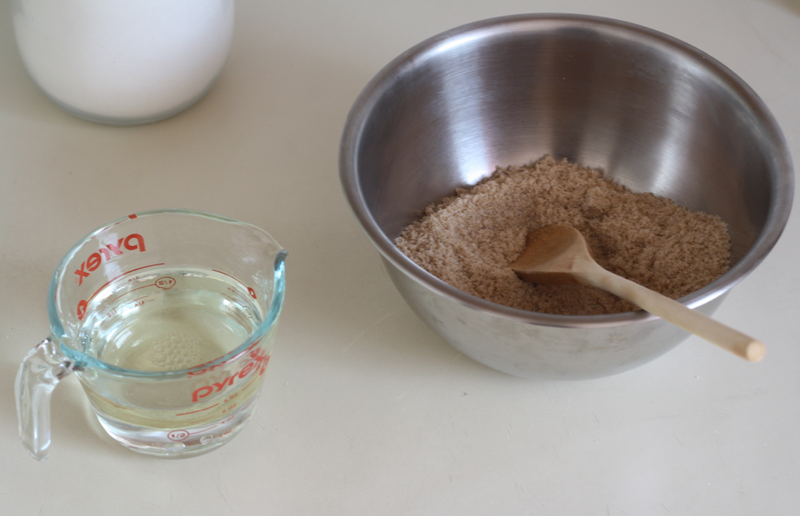 In a medium bowl stir together sugars, oil, water and vanilla. Add the dry ingredients to the wet ingredients and mix until combined. Pour into the prepared pan, smooth the top and bake for 20-25 minutes or until a tester comes out with just a few crumbs attached. The top of the bars will not brown so be careful not to overbake. Let the bars cool in the pan for 10 minutes then lift out and let cool completely on a rack. 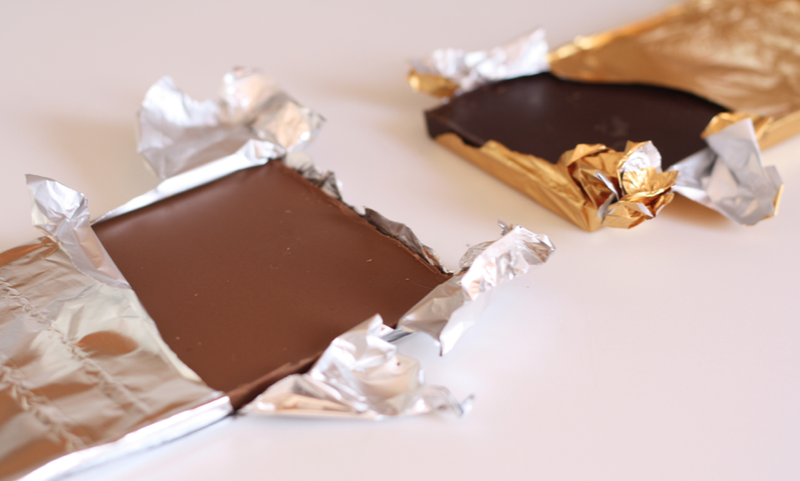 When the bars are cool, slice into squares or rectangles. Meanwhile make the dip. 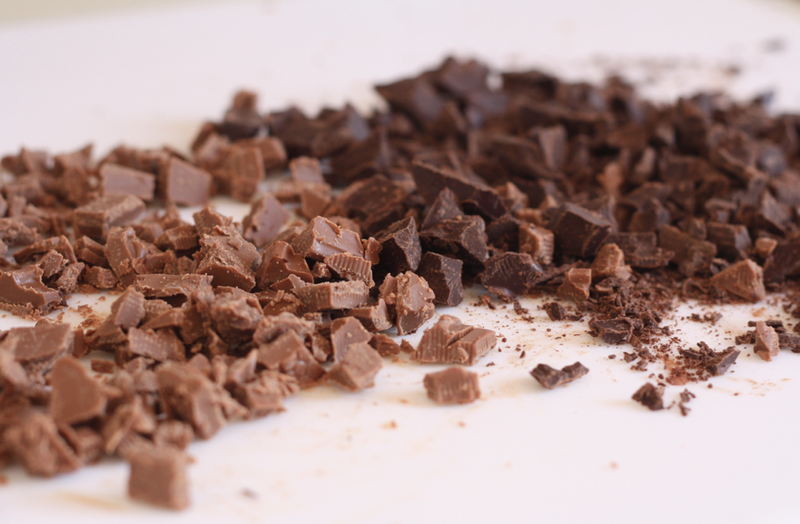 In a heatproof bowl set over a pan of barely simmering water, melt the chopped chocolate, stirring occasionally, until smooth. Line a baking sheet with waxed paper and set aside. 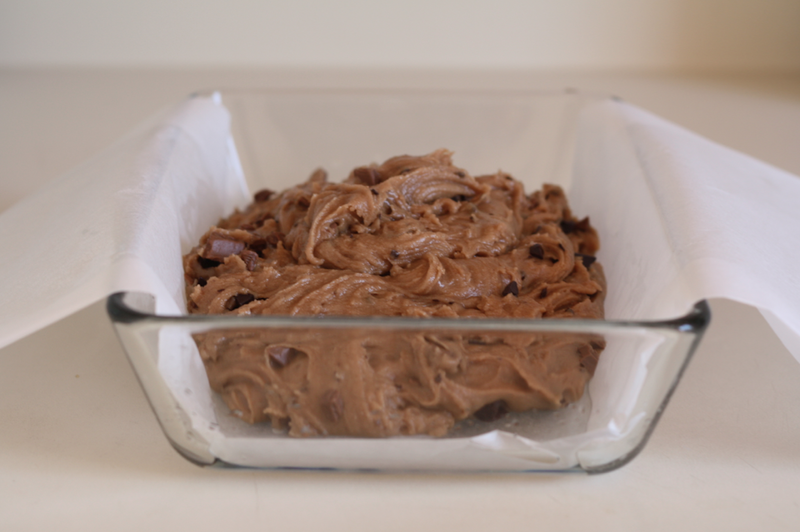 One at a time, dip the top of each bar into the melted chocolate and place on the prepared pan. 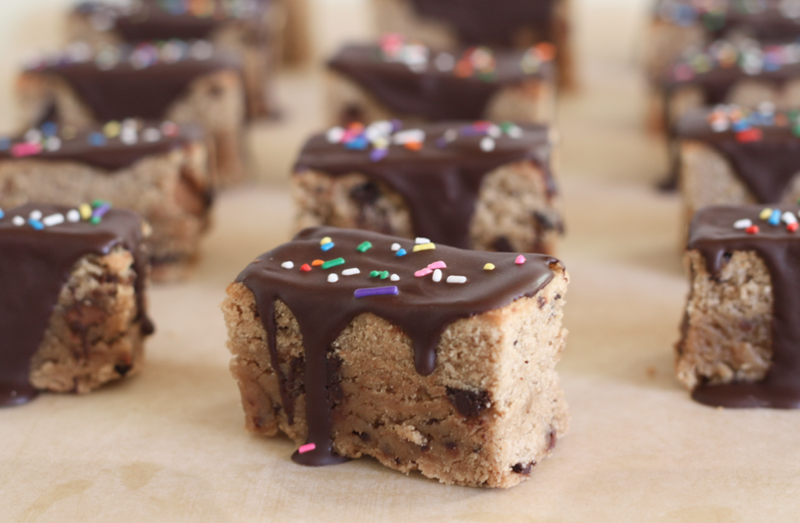 Alternatively, you can drizzle the melted chocolate over the top of each bar. 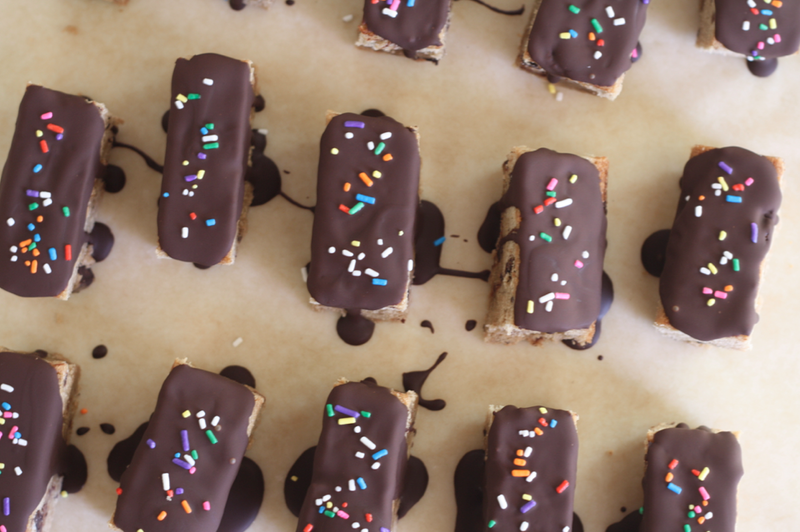 Top each bar with sprinkles. When all the bars have been topped, transfer to the fridge for 10 minutes to set the chocolate. Serve chilled or at room temperature. 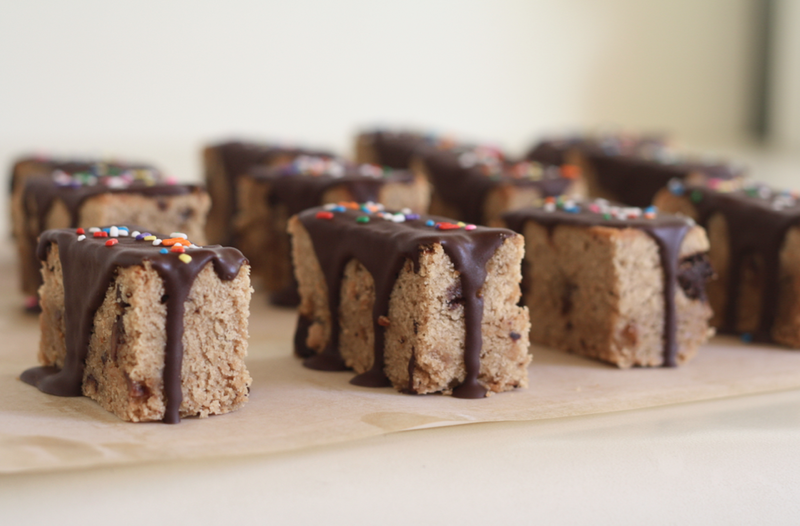 *Or use 2/3 cup vegan chocolate chips to make these bars truly vegan! I am all over these! LOVE the chocolate on top! Would love to get my hands on these, the sprinkles are so cute. I always love adding to my trove of pantry-friendly recipes. This looks like a perfect treat to whip up and bring along to a last minute dinner party or coffee meet-up with girl friends. Thanks for sharing! Welcome back! These are a perfect little fall treat aren’t they? & I love that they’re so nearly vegan, definitely going to be making these. these look incredible and so simple!!! I have just found your blog. It is lovely. So is the coming of fall. 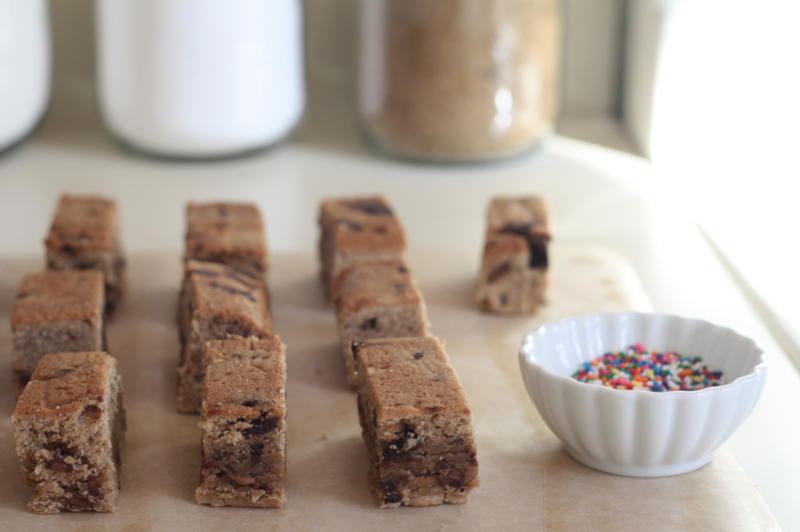 And so are the dipped double chocolate chunk cookie bars. I’m very excited for both! So glad your summer hiatus is over. I’m trying the lavender shortbread this week and the chocolate dipped cookies for our bunko night. Thanks for the ideas. These look very good but I can’t quite imagine how they will taste, which means…. I am going to have to make them! These look delicious! I love the chocolate on top – makes them look so pretty, and I bet makes them taste even better! I’m so happy to have fall weather – I live in NYC too and it is just brutal in the summer! I just found your website. I live in Brooklyn too. I can’t wait to try out this recipe. They look amazing and there’s no eggs! Hopefully, after I make it, there will still be some left for others to taste. Gosh! I love this recipe, easy to cook, looks really good. I want to taste it.